September is here and Autumn is soon approaching (Friday 22nd September if you are wondering) this means bad news for those going back to school/uni but good news if you are a blogger! Lots of pretty pictures of leaves and hot chocolate waiting to be taken for Instagram and Autumnal posts to be typed up but wait…….. your mind has gone blank! You have the dreaded blogger’s block and wtf are you going to write between now and December?! 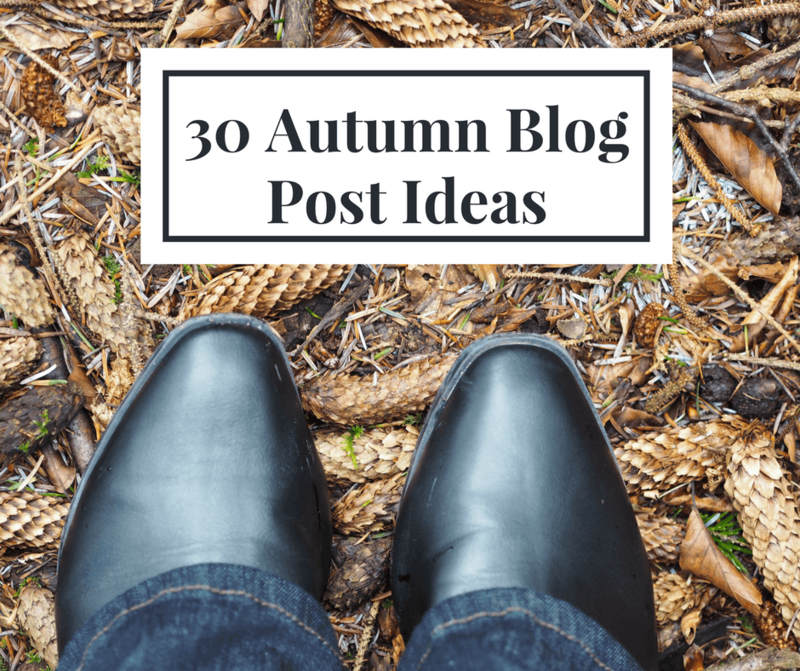 Following on from my 30 Spring Blog Post Ideas that I posted earlier this year, I decided to also do one for Autumn. So if you are ever stuck for for what to write then check out my Autumn blog post ideas below. Ultimate cosy night in – what are the essentials for having a cosy night in. Things you love about Autumn – list the things you love about this season. Autumn Look Book – show us your cosy jumpers, scarves, etc that you will be wearing this season. Tips on dealing with the darker mornings/evenings – what do you do to make getting up easier when it’s dark outside. Decorate your house for Autumn/Halloween – show us pics of your decor. Halloween Haul – been buying things for Halloween? Show us what you have bought. Your Autumnal skin care routine – now that the central heating is on and your skin is becoming drier what do you do to keep your skin soft and flake free. Autumn bucket list – what’s on your list this season that you want to tick off? How to host a Halloween party – tell us how to have a Halloween party that will be remembered for years to come. What’s in your Autumn make up bag – show us what this season’s lipstick is. Favourite Halloween films – tell us what your favourite films are that we should be watching on Halloween. Halloween make up tutorial- show us how to perfect a skull or wound using making up. An Autumn recipe – share your favourite comfort food that you love to eat during the Autumn. Favourite cosy jumpers – show us what jumpers we should be wearing this season. Lush Autumn/Halloween haul – this is the best time of year for buying Lush products so show us what you bought. Autumnal photo props – what props do you use in your photos for the Autumn season. Halloween costume ideas – diy or shop bought, show us what we could be wearing to our Halloween party. DIY Autumn/Halloween decorations – get your craft on and show us how we can do it. 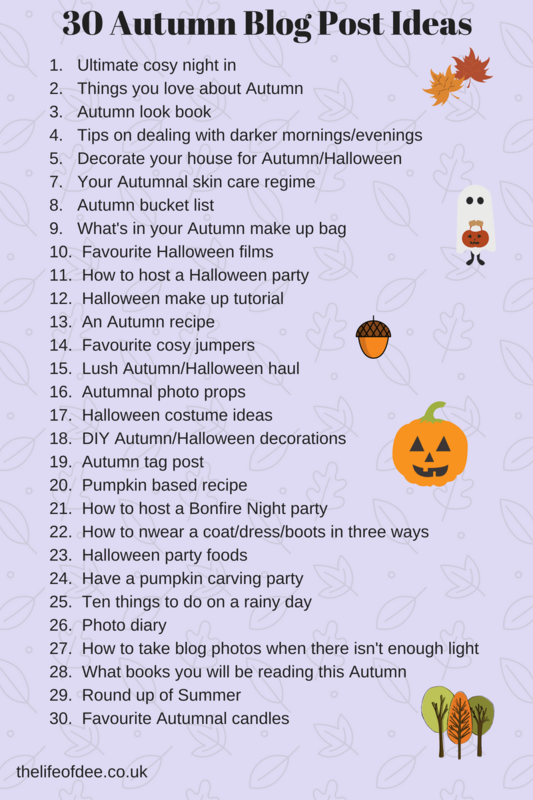 Autumn tag post – answer Autumn related questions and tag other bloggers in it to do the same. Pumpkin based recipe – it’s Autumn so therefore it is the law to consume pumpkin flavoured food/drink. How to host a Bonfire Night party – having a bonfire night party? Tell us how you host yours. How to wear a coat/dress/boots in three ways – show us how to style a wardrobe item and get three different looks out of it. Halloween party foods – what foods should we be making for our party. Have a pumpkin carving party – get some friends round, buy a few pumpkins and start carving them. Maybe lay off the alcohol until you have finished carving otherwise you may lose a finger or two. Good props for a Halloween party though ;)! Ten things to do on a rainy day – what can we do to relieve the boredom when it’s yet another cold and miserable day outside. Photo diary – show us how pretty the trees are around you this Autumn or of your trip to the Pumpkin Patch. How to take blog photos when there isn’t much light – being in the UK means we don’t get much daylight during the last few months of the year. What do you do to take brighter photos? What books you will be reading this Autumn – what’s on your reading list while you are snuggled up with a hot chocolate. Round up of Summer – if you are still not accepting that Autumn is here, reminisce about what you got up to this Summer. Favourite Autumnal candles – which ones will you be burning this season. I hope that you found this list useful, if you can think of any others I would love to hear them. Love this list! Going to have to pull from it this fall! Thanks for posting it!! Amazing ideas! I love Autumn, it’s my favourite time of year. So excited to read everyone’s autumn blog posts! These are great ideas! You really got my wheels turning on things to write about and that was quite a few! Thanks for sharing! I am definitely ready for autumn to be here. It’s nice for it to be a little cooler even if it’s not fully here yet. Thanks for all the great ideas here. I love this list, as much as I am going to miss Summer this list makes me excited from Autumn! Hi! Lovely ideas – I have to get writing now. Going to dig out some halloween tricks from last year.